Complete end-to-end testing of GPS systems must, by definition, include the application’s receiving antenna. GPS Repeaters are a viable option where potential interference issues are not a concern. 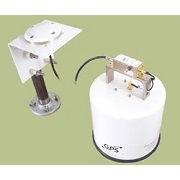 When a GPS Repeater is not an option, a viable and cost effective solution is the GPS Source Antenna Hood. At a fraction of the cost of a full blown screen room or chamber, the GPS Source Antenna Hood (GPSRH) will supply your application’s receive antenna with the necessary GPS signals.